SOUTH FALLSBURG (May 18, 2015) – On Saturday, May 30 at 11 a.m., The Right Rev. 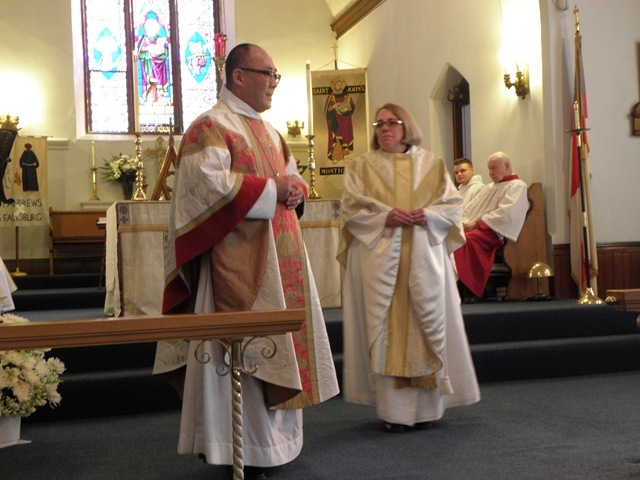 Allen K. Shin, Suffragan Bishop of the Diocese of New York (in photo left officiating during the recent ordination of Rev. Diana Scheide), will preach and celebrate Mass at St. Andrew’s Episcopal Church, 5277 State Route 52 in South Fallsburg. The occasion marks the Centennial Year of the church, founded by the families of some of the very same people who worship there today. A reception will follow the service, welcoming special guests, some of which are former priests at St. Andrew’s. The church, which has been described as “in the vernacular style of the early Nineteenth Century” was physically built by the congregation, and that hands-on feeling is still evident today, with members of St. Andrew’s running a twice monthly food pantry for the Town of Fallsburg, and also offering free chamber music concerts. St. Andrew’s hopes that this celebration is just the beginning of another 100 years of service to the community. St. Andrew’s is part of a four parish collaboration known as the Delaware Catskill Episcopal Ministry that also includes Grace Church in Port Jervis, St. James’ Church in Callicoon and St. John’s Church in Monticello. For more information, call: 845-807-3418.